A photograph that won an award at the recent Worldwide Photwalk is now a jigsaw puzzle on Samgine. 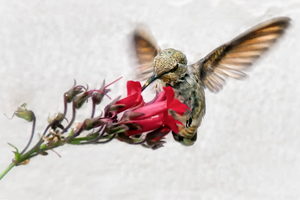 The shot is an amazing image of a hummingbird feeding on a flower and is titled “Sweet Morning Nectar”. The photograph was taken by the very talented Pam Borrelli. Samgine has feature several other images from her portfolio and they are all wonderful photos. Click here to play the jigsaw puzzle and don’t forget to check out Pam’s portfolio of work at her website. The Worldwide Photowalk is an event started three years ago by best selling photography book author Scott Kelby. In 2010 there were over 33 thousand walkers at over one thousand different locations across the globe. Photographers gather at a pre-arranged location and then share a walk together taking photographs along the way. Sweet Morning Nectar won the “Best Photo” award for the San Francisco walk. To see it and other images from the San Francisco walk check out their page.